… And there it was! 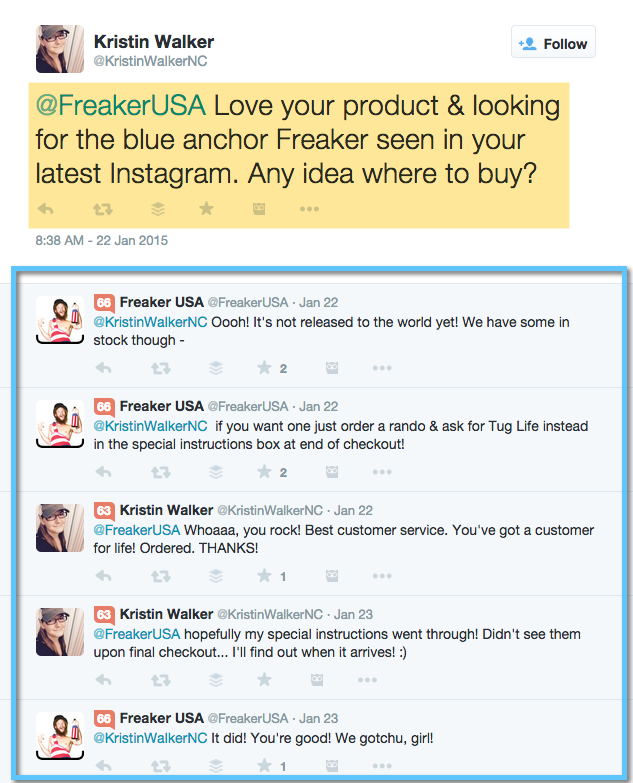 The anchor Freaker I knew I always wanted but didn’t know existed. Living at the beach and growing up fishing on the waters, I have developed a keen taste for anything nautical. 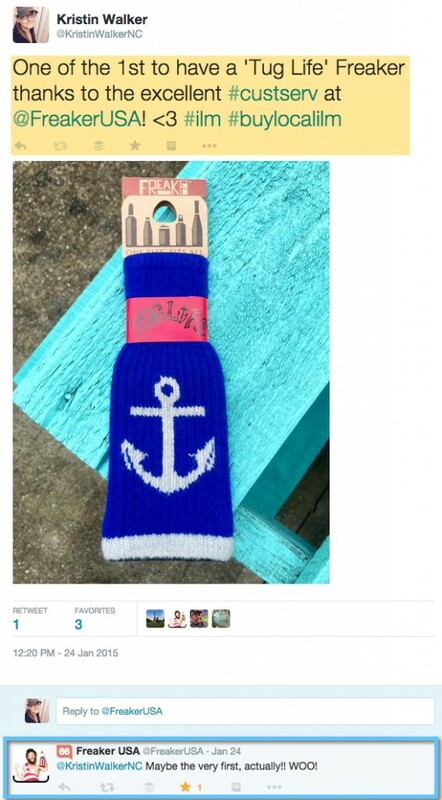 I immediately took to Twitter after searching for the anchor Freaker on their online store and not finding what I was looking for. After being told this particular design had not been released yet, I was ALSO told they had some in stock and that I could I ask for one in the “special instructions” box after ordering another random design! Well, I did just that and when I had concerns about my “special instructions” not going through, FreakerUSA actually checked on the specific order and told me that it had. How’s THAT for social customer service?! 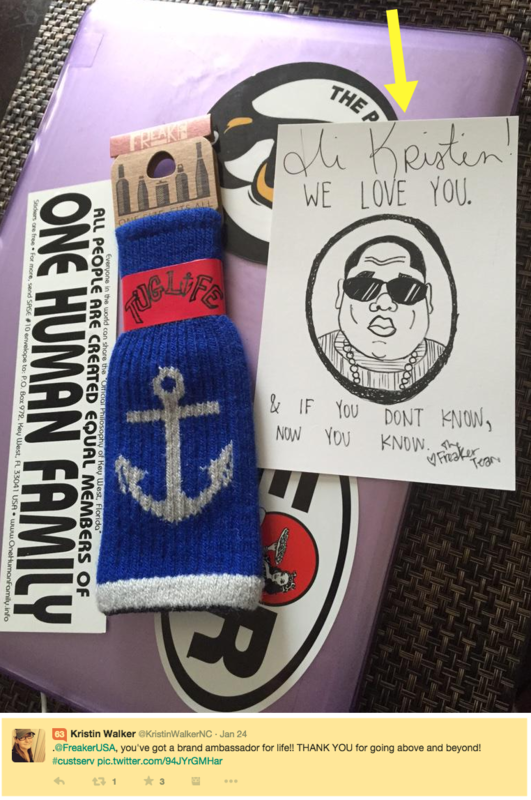 My “Tug Life” Freaker arrived the very NEXT day with a personalized thank you card attached. It wasn’t until I tweeted about my experience that I found out I was the VERY first to own one of these nautical Freakers! Talk about feeling important! 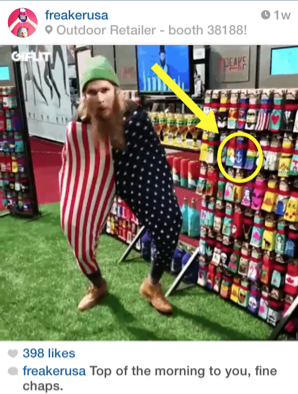 FreakerUSA made the entire process seamless and unforgettable. So what are the takeaways that your brand can learn from this experience to ensure you have even more happy customers? Listen and Engage- If you haven’t taken to monitoring and engaging on your brand’s social sphere, minimize this tab right now and start. Seriously. Not only do potential customers search social media for reviews, pictures, etc. but engaging with customers on social media increases brand positivity. When questions, comments, mentions, and complaints are addressed quickly and effectively, consumers feel important and acknowledged. That goes a long way. Sometimes brands have the tendency to forget that social media should be SOCIAL- not just promotional posts. A “like” goes a long way today, and engagement is essential in social success. Personalize and Humanize- On the social sphere, your brand should share it’s personality with the world. Newsflash big brands: nobody wants to interact with robotic responses. Humanize your brand by creating and integrating a “brand voice” and having fun with it. Be the company that people can count on for prompt responses, great posts, and interesting material. Be the brand you want to talk to and personify your social media strategy to adapt to this. Go Above and Beyond– Sometimes it is the smallest things that leave the biggest impact on others when it comes to customer service. As a brand it is important to keep in mind that there is a time and a place to generalize your audience, but when responding or reaching out to individuals, that is NOT that time. Personalize a message. Retweet a shoutout. If someone reaches out to you, do something to make them feel special as an individual- not as a statistic. My experience left me feeling on top of the world with Freaker because not only was my special purchase prompt with delivery, but I also got the great note. When did the world dismiss a hand written letter to the hands of an email?